From all over the world young people gather in our parish to study, work, live and meet new friends. Veenendaal and Ede are two of the bigger cities in our parish and hold many higher educations, whereas Wageningen is particularly known for its university and young international population. 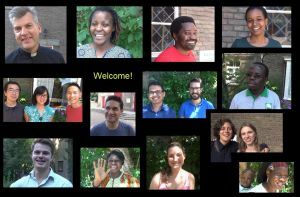 Did you know that Wageningen has the most nationalities/mile2…in the world? You’ll meet many of them at the campus and in the cafés. But what about the church? Maybe you were used to regularly visit a parish back home, or maybe you’re just curious and like to come by some time? The ICC welcomes you all! Many of the members have lived in the Netherlands for a long time already, some stay around for just a couple years, and some are new. On this part of the website, you will find information about the community and activities they organize or that are otherwise of interest for you. For an impression of the diversity of ICC, click on the image above to watch a full movie. Different members speak about ICC; click here to view them all. Attached you will find the Holy Mass schedule of April.